As a reminder, my name is Rachel Creager and I am the coordinator of the Educational Outreach Program at the Defense Forensic Science Center (DFSC). We have you listed in our database as a university contact for undergraduate internship opportunities. I am reaching out to you today to let you know about Research Associate (RA) positions that we have available at DFSC. 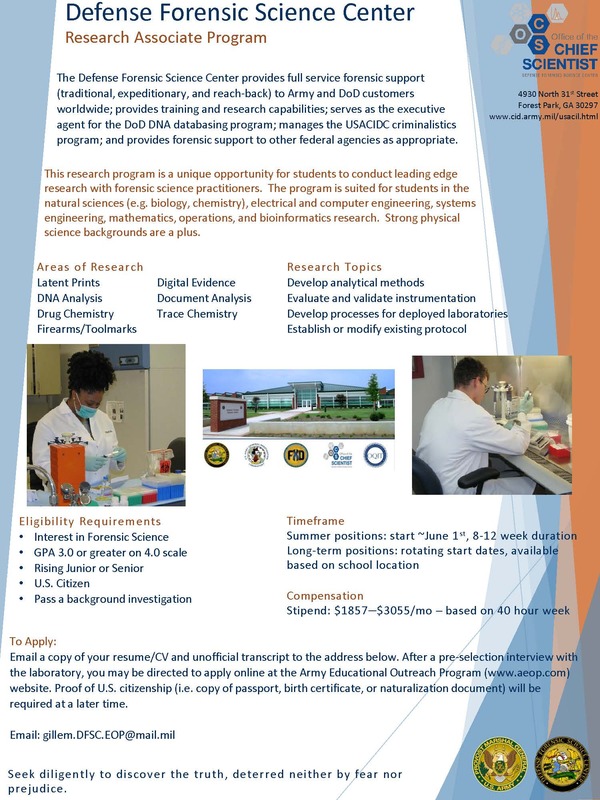 Our RA program (see attached flyer) differs from traditional internship programs in that students at our facility participate directly on a research project. Furthermore, our research associate program includes a monthly stipend of up to $3055/month. The research associate candidate requirements are as follows: 3.0+ GPA on a 4.0 scale, pursuing undergraduate degree (or within one year of completion of an undergraduate degree), U.S. citizen, and able to successfully pass a background check. 1) Students at universities within the Atlanta metro area, allowing them to work around their class schedules. 2) Students within twelve months of completing their undergraduate degree but without beginning a graduate program. 3) Students at universities that allow them to take a semester off from class to participate in an internship. 3) A write-up of any research experience that you have. A new GC-MS system has been recently released. Please write a short study plan to validate the new system and compare it to the current GC-MS in use. Parameters for testing include robustness, repeatability, accuracy, precision, sensitivity, true cost of ownership, system requirements, and user friendliness. Three new NGS kits have recently been released onto the market and DFSC needs to determine which kit would be best to take forward to case work. Please write a short study plan to evaluate the new kits for potential implementation. A single-step fingerprint processing product has been recently developed. Please write a short study plan to evaluate the new product and compare it to the currently used two-step technique.